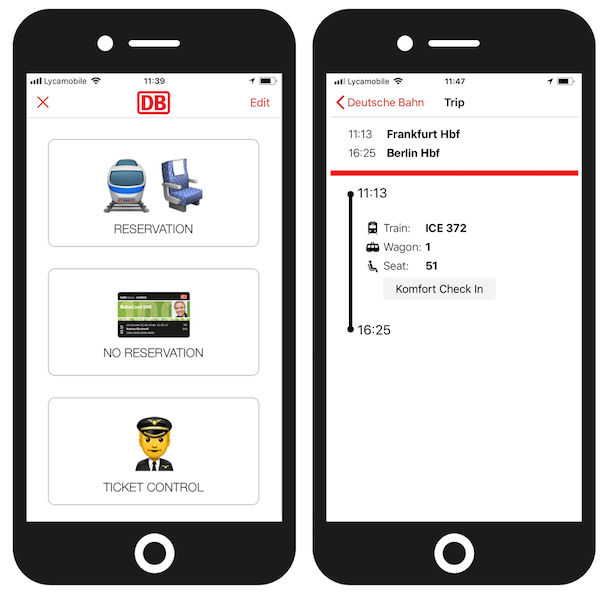 This post is a walk through of the Comfort Check-in solution we presented for Deutsche Bahn earlier this year, as part of the DB Comfort Check-in Localization Challenge. We presented our solution on a train ride between Frankfurt and Berlin. This blog post is related to Deutsche Bahn Comfort Check-in with Matchmore - An Introduction (1/2). In that post, we describe and elaborate on the possibilities of seat management and Matchmore. If you are curious about seat management in other industries, or in other solutions than QR-codes such as with Near Field Communication (NFC), we suggest that you read that post as well. The post will start from the passenger's perspective, and later explain the solution from the conductor's point of view. Please note that this solution can only be used for passengers with mobile tickets. Two scenarios are presented below. Scenario 1 presents the situation where the passenger has a seat reservation and wants to check in at his/her seat. Scenario 2 explains the situation when the passenger has a BahnCard 100 for unlimited traveling and has no seat reservation, and wants to find an available seat for the journey. For this scenario, two cases are presented. Case a presents a passenger with a seat reservation in the right train, in the right wagon and at the right seat. Case b presents a passenger with a seat reservation, but is located at the wrong seat. Events 1-8 apply to both cases, while events 9-11 are divided into case a and case b. 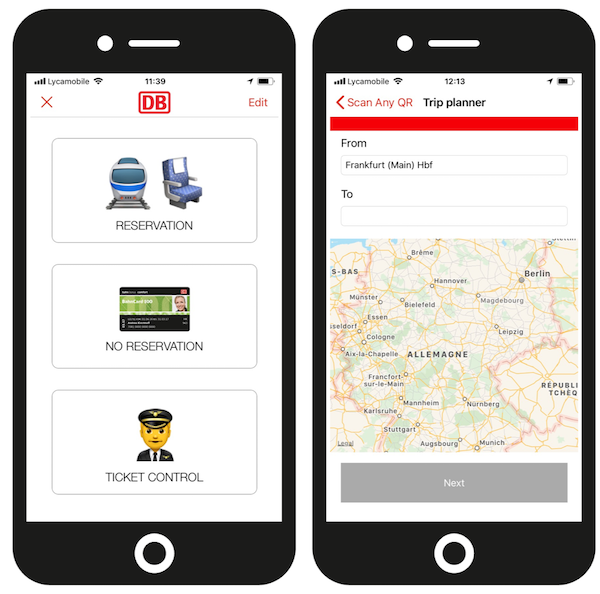 The passenger purchases a ticket and reserves his/her seat in the DB Navigator app (the app) or online. The DB central system generates a ticket and a seat reservation (in this example: train ICE 372, wagon 1 and seat 51). The information is sent to the passenger's mobile phone and is saved in the central system. The passenger enters the right train, the right wagon and finds his/her seat. At the right seat, the passenger opens the app with the check-in functionality and sees "Reservation", "No Reservation" and "Ticket Control". After clicking on "Reservation" the passenger will land at a new page with all details related to the ticket and the seat reservation such as place and time of departure and arrival, train number, wagon number and seat number. The passenger clicks on the button that says "Comfort Check-in". The passenger's mobile phone camera will automatically open and he/she will be able to scan the QR code next to his/her seat. 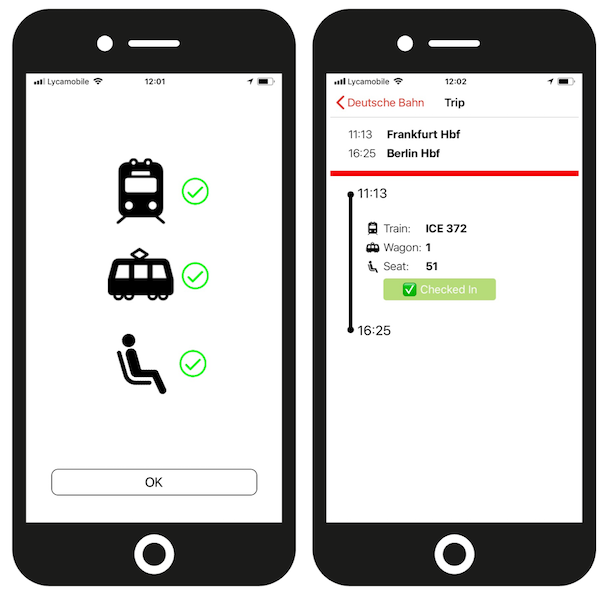 Thanks to Matchmore's technology, the app and the central system verifies if there is a match between the physical seat and the reservation. Case a. The passenger is in the right train, in the right wagon and at the right seat. Let's assume the passenger performs all steps 1-8 described above. And when the passenger scans the QR code next to the seat, there is a match between the physical seat and the reservation. 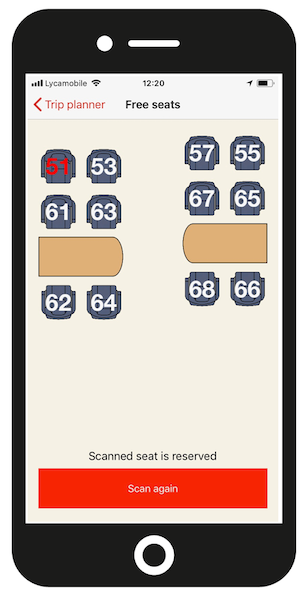 If the physical seat and the reservation correspond, a match is generated. The passenger will see three green check marks on the app. The central system will be informed that check-in has been done and the information will be up-to-date in the central system. (If there is no match, see case b). After the generated match, the passenger will receive a notification with a confirmation of the check-in. The passenger will also be able to see on his/her trip that the check-in has been done. 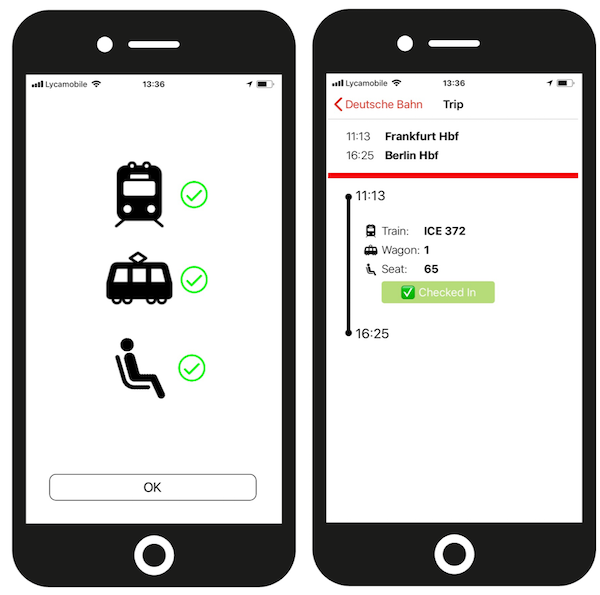 When the passenger arrives to his/her destination, the reservation is automatically "checked-out" based on the location of the passenger and train. If necessary, this could also be done manually by the passenger by just clicking on a button on the app. Case b. The passenger is not in the right train, or in the right wagon or at the right seat. Let's assume the passenger performs all steps 1-8 described above. But when the passenger scans the QR code next to the seat, there is no match between the physical seat and the reservation. If the physical seat and the reservation don't correspond, a match will not be generated, and the central system will not be informed. A window will appear and indicate that the passenger is either in the wrong train, in the wrong wagon or at the wrong seat. 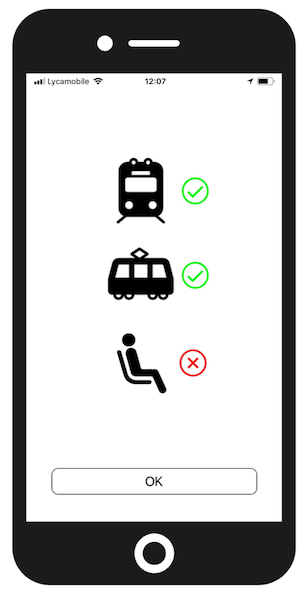 If the passenger is in the wrong wagon or at the wrong seat, the app will display what direction he/she has to go in order to find the right seat. If the passenger is at the wrong train, he/she better get off quickly! After the passenger has found the right train, the right wagon and the right seat, he/she can start the process of Comfort Check-in as done in case a and check-in properly. Scenario # 2: A BahnCard 100 passenger with no seat reservation. This scenario is for passengers who possess the BahnCard 100 for unlimited traveling. For this scenario, two cases are presented. Case a describes the situation where the chosen seat is available. Case b describes the situation where the chosen seat is not available, and the passenger must find another (free) seat. Events 1-3 apply to both cases, while events 4-8 are divided into case a and case b. The BahnCard 100 passenger enters the train and finds a free seat. The passenger opens the app and chooses "No Reservation" at the starting screen. This will take the passenger directly to the camera of the phone in order for him/her to scan the QR code next to the chosen free seat. After the scanning, the passenger must tell the app his/her departure and final destination. Case a. The chosen seat is available. Let's assume the passenger performs all steps 1-3 described above. And when the passenger scans the QR code next to the seat, the seat is available for the entire trip since nobody else has reserved that seat. 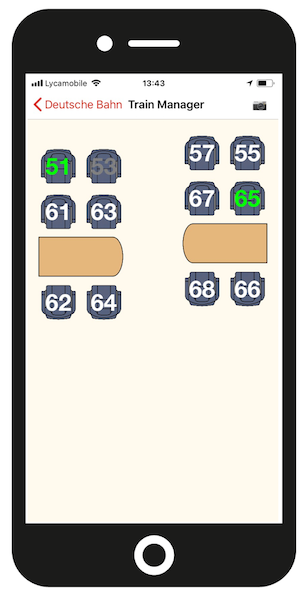 If the seat is not reserved by another passenger, a match is generated. The passenger will see three green check marks on the app. The central system will be informed that check-in has been done and the information will be up-to-date in the central system. The check-in will also be confirmed on the passenger's trip in the app. The BahnCard 100 passenger can now sit back and enjoy the train ride to his/her destination. Let's assume the passenger performs all steps 1-3 described above. But when the passenger scans the QR code next to the seat, the seat is not available for the entire trip since somebody else has reserved that seat for at least a subsection of the trip. If the seat is already reserved by another passenger, between the BahnCard 100 passenger's point of departure and destination, there will be no match. The passenger will directly receive an overview of the wagon with available seats for his/her journey. Reserved seats will be showed in red, and available seats in white. The passenger has to find an available (white) seat in the current wagon. When he/she arrives to the available (white) seat, he/she scans the QR code next to the seat. A match will be generated. The passenger will see three green check marks on the app. The central system will be informed that check-in has been done and the information will be up-to-date in the central system. When the conductor of the train starts the process of controlling tickets, he/she starts by scanning a QR code of the first wagon. The app will show an overview of the seats in the wagon. The overview will show seats in green, gray and white - all colors represent different stages in the check-in process. The conductor has a connected mobile device with a camera. When he/she enters a wagon, the conductor will scan a QR code which is unique for the specific wagon. The wagon is identified, and the conductor will receive an overview with the seats of the wagon. A green seat indicates that the ticket has been paid and that the reservation and the check-in are all done. A white seat indicates that there is no reservation to the seat. A gray seat indicates that the seat is reserved, but no one has checked-in yet. The conductor will exclusively focus on the white and gray seats, since the green seats are all good. If a white seat is occupied, the conductor can ask the passenger if he/she wishes to reserve the seat. If a gray seat is occupied by the right passenger, the conductor can check-in for the passenger. When the wagon is all checked, the conductor moves into the next wagon and scans its QR code. Don't forget to read the first post in this blog post series about the Deutsche Bahn case, Deutsche Bahn Comfort Check-in with Matchmore - An Introduction (1/2).